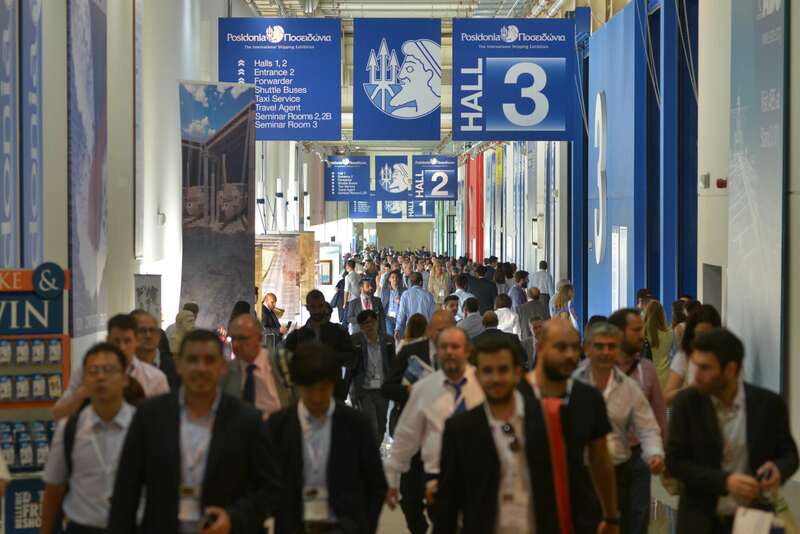 With some five months still to go before the June 4 opening day, Posidonia 2018 is cruising full speed ahead to yet another record-breaking year with space bookings already up by 10% compared to the same time two years ago and over 90% of exhibition floor already committed. Organisers project that over 1,850 companies will exhibit their products and services at this year’s event and visitor numbers will rise to 22,000. The increased demand for participation at the world’s most prestigious shipping trade event has resulted in the addition of 1,000sqm of exhibitor floor space just to keep up with increased demand, which is derived from a strong Greek order book for newbuildings and upgrades of the existing fleet to modernise ICT standards and meet ever stringent environmental regulations. “Posidonia’s strength and appeal is drawn by the collective quality and reputation of its exhibitors, delegates and visitors, debutants or repeaters, who commit funds and resources every two years to be part of a signature industry event that is a true celebration of everything shipping stands for,” said Theodore Vokos, Executive Director, Posidonia Exhibitions S.A., the biennial event’s organiser. “A key attraction remains the strong presence of the powerful Greek shipowning community at every Posidonia, which is leading global newbuilding activity with 61 Greek companies having ships on order worth an estimated US$16bn.” said Vokos. Over 260 ships built to high specs, with many of them Tier II and Tier III compliant are on order for Greek interests at the dawn of 2018, 105 of them contracted in 2017. The spending spree is also regulation driven and stems from the recent ratification of the ballast water treatment treaty and type approvals by the US Coast Guard, as well as new regulations regarding SOX and NOX emissions and Monitoring, Reporting and verification (MRV) requirements, which have speeded up investment in scrubbers, LNG fueled ships and digitalisation of operations. With Greek interests currently running the most modern fleet globally and operating all across the globe, compliance with new environmental regulations is a must for Greek shipowners. Some shipping companies, such as Capital Maritime & Trading, predict that new environmental regulations will make a quarter of today’s global fleet obsolete, giving them reason to invest $1,1 billion in upgrading 71 ships and ordering new ones. This flurry in newbuilding orders and fleet upgrades is drawing the world’s maritime industry to Posidonia 2018 in bigger numbers than ever before with space bookings or expressions of interest surpassing any previously set event record. Once more the Posidonia exhibition space will be dominated by some 20 national pavilions and especially the leading shipbuilding nations, such as the traditional Far Eastern power houses of China, Japan and South Korea. Maritime Centres such as Hong Kong, Singapore, Dubai and many others will once more present their wide range of services to the global shipping industry and long-standing exhibitors such as the USA, UK, Denmark and Holland will field greater participations than before. But national participation is not reserved only for traditional maritime nations, as Posidonia welcomes newcomers such as landlocked Luxembourg and agricultural economies like Georgia, while Poland will also make its debut. The majority of flag states will also be present at Posidonia, with Panama, Liberia, the Marshall Islands, Malta, Cyprus, the Bahamas, the Cayman Islands and Palau amongst others returning once more to the heartbeat of global shipping. Among the new highlights we count the Greek pavilion organised by HEMEXPO, the association of Hellenic Marine Equipment Manufacturers and Exporters, which will span over 400 sqm of exhibition space with the mission to promote Greek engineering and experienced maritime solutions for the global shipping industry and looking to further expand its offerings on the makers lists of the most important shipyards worldwide. The Greek presence is complemented by a second Greek pavilion, organised by the Worldwide Industrial & Marine Association (WIMA), representing Greek companies active in the fields of ship construction, ship spare parts & supplies, ship technical and general services and marine equipment manufacturing. Another important new participant is the Greek utility company Gastrade, backed by Gaslog Ltd, which will manage the Alexandroupolis Independent Natural Gas System (INGS), a modern, cutting edge technology project which comprises an offshore floating unit for the reception, storage and re-gasification of LNG and a system of a subsea and an onshore gas transmission pipeline through which the natural gas is shipped into the Greek National Natural Gas System (NNGS) and onwards to the final consumers. Furthermore, Saudi Arabia’s state oil company Saudi Aramco, and its partners Lamprell, the National Shipping Company of Saudi Arabia (Bahri) and Hyundai Heavy Industries, have chosen Posidonia 2018 for the global unveiling of its International Maritime Industries (IMI) joint venture, created to develop one of the world’s largest full-service maritime facilities which will include a new shipyard focused on the offshore sector. The new project has already received orders for more than 20 rigs and 52 ships over the next decade. And while oil continues to fuel humanity’s universal transportation needs, data is fast becoming the new oil spinning out a whole new brave world where artificial intelligence and smart shipping will dominate. The drive for digitalisation, the increased needs for smart shipping solutions and high demand for constant fleet connectivity has led to an impressive Posidonia outing by the ICT sector, with over 30 companies confirming their participation in order to compete for a bigger slice of the ever-growing needs of the most modern fleet the world has ever seen. The Posidonia conference and seminars programme has started filling up and will once more include over 30 conferences, product presentations, technical seminars and press conferences, all taking place at the Metropolitan Expo. The conference programme will start with the prestigious TradewindsShipowners Forum which will tackle current issues facing shipping. An important new event will be the HEMEXPO powered “SUPPORT THE LOCAL MARITIME INDUSTRY SUMMIT”, organised by Newsfront – Naftiliaki and to take place under the auspices of the Marine Technical Managers Association (MARTECMA), which will give Greek shipping companies the opportunity to familiarize themselves with the state of the art HEMEXPO products and services. This conference will enable them to make educated decisions on future investments going forward and will also further promote the Greek maritime cluster, which is on track to contributing an ever-growing part of the national GDP. A new feature of the Posidonia Conference and Seminar programme will be the 4th Energy & Shipping Seminar, organised by the Institute of Energy for South East Europe (IENE), which will provide an in-depth analysis of the Global Oil and Gas Markets and analyse the factors that define the correlation between energy cargoes and shipping. Μόλις 5 μήνες πριν από την έναρξη στις 4 Ιουνίου, τα Ποσειδώνια 2018 οδεύουν ολοταχώς για ρεκόρ συμμετοχών, με τις κρατήσεις για εκθεσιακό χώρο να είναι αυξημένες ήδη κατά 10% σε σύγκριση με την προηγούμενη έκθεση και ποσοστό άνω του 90% του εκθεσιακού χώρου να έχει ήδη δεσμευτεί. Οι διοργανωτές προβλέπουν ότι περισσότερες από 1.850 εταιρείες θα εκθέσουν τα προϊόντα και τις υπηρεσίες τους στη φετινή διοργάνωση και οι επισκέπτες θα ξεπεράσουν τους 22.000. Η αυξημένη ζήτηση για συμμετοχή στην σημαντικότερη ναυτιλιακή έκθεση στον κόσμο, είχε ως αποτέλεσμα την επέκταση του εκθεσιακού χώρου κατά 1.000τμ. Αυτό προέκυψε λόγω των αυξημένων ελληνικών παραγγελιών για νέες ναυπηγήσεις και της ανάγκης εκσυγχρονισμού των υφιστάμενων πλοίων με νέες τεχνολογίες πληροφορικής και επικοινωνίας, αλλά και προσαρμογής τους στους νέους αυστηρούς περιβαλλοντικούς κανονισμούς. «Η δυναμική των Ποσειδωνίων απορρέει από την ποιότητα και το κύρος των εκθετών και των επισκεπτών της, οι οποίοι κάθε δύο χρόνια αφιερώνουν σημαντικούς πόρους, πολύτιμο χρόνο και ανθρώπινο δυναμικό προκειμένου να συμμετέχουν σε αυτή την έκθεση-ορόσημο που συγκεντρώνει το σύνολο της παγκόσμιας ναυτιλιακής βιομηχανίας», δήλωσε ο κ. Θεόδωρος Βώκος, Εκτελεστικός Διευθυντής των Εκθέσεων Ποσειδώνια Α.Ε, διοργανωτή της διετούς έκθεσης. «Κύριος πόλος έλξης σε κάθε έκθεση των Ποσειδωνίων παραμένει η ισχυρή παρουσία της ελληνικής ναυτιλιακής κοινότητας, η οποία ηγείται της παγκόσμιας ναυπηγικής δραστηριότητας, με 61 ελληνικές εταιρείες να έχουν παραγγείλει πλοία συνολικής αξίας περίπου 16 δισ. δολαρίων», συμπλήρωσε ο κ. Βώκος. Είναι χαρακτηριστικό ότι στο ξεκίνημα του 2018 υπάρχουν περισσότερες από 260 παραγγελίες για ναυπήγηση πλοίων ελληνικών συμφερόντων με υψηλότατες προδιαγραφές, με τις 105 παραγγελίες να έχουν δοθεί εντός του 2017. Τα πλοία αυτά θα συμμορφώνονται με τους νέους κανονισμούς Tier ΙΙ και Tier ΙΙΙ, που εξασφαλίζουν ότι ο ελληνικός στόλος θα είναι ο πλέον σύγχρονος παγκοσμίως και θα συμμορφώνεται με τους νέους περιβαλλοντικούς κανονισμούς, που αποτελεί προτεραιότητα για τους Έλληνες πλοιοκτήτες. Αυτή η κινητικότητα αποδίδεται στην ανάγκη συμμόρφωσης με νέους κανονισμούς, όπως την πρόσφατη κύρωση της σύμβασης για τη διαχείριση έρματος και τις νέες προδιαγραφές που θέτει η Αμερικανική Ακτοφυλακή, όσο και στους νέους κανονισμούς σχετικά με τις εκπομπές SOx και NOx και τις απαιτήσεις MRV (Monitoring, ReportingandVerification), που επιτάχυναν τις επενδύσεις σε πλοία που θα έχουν τη δυνατότητα να κινούνται με Υγροποιημένο Φυσικό Αέριο (LNG), καθώς και στην ψηφιοποίηση των λειτουργιών των πλοίων. Χαρακτηριστικά, ναυτιλιακές εταιρείες, όπως η CapitalMaritime&Trading, προβλέπουν ότι οι νέοι περιβαλλοντικοί κανονισμοί θα θέσουν σε αχρηστία το ένα τρίτο του σημερινού παγκόσμιου στόλου, εξέλιξη που ωθεί την επένδυση εκ μέρους τους 1,1 δισ. δολαρίων στην αναβάθμιση 71 πλοίων και την παραγγελία νέων. Αυτό το κύμα παραγγελιών για ναυπηγήσεις πλοίων και αναβάθμιση του στόλου προσελκύει την παγκόσμια ναυτιλιακή βιομηχανία στα Ποσειδώνια 2018, με την συμμετοχή παλαιών και νέων εκθετών να ξεπερνούν κάθε προηγούμενο. Για άλλη μια φορά, τον εκθεσιακό χώρο των Ποσειδωνίων θα καταλάβουνπερίπου 20 εθνικά περίπτερα και ιδίως αυτά των κορυφαίων ναυπηγικών κρατών, με κυρίαρχους τους παραδοσιακούς οίκους της Άπω ΑνατολήςΙαπωνία, Νότια Κορέα και Κίνα. Ναυτιλιακά κέντρα όπως το Χονγκ Κονγκ, η Σιγκαπούρη, το Ντουμπάι και πολλά άλλα θα παρουσιάσουν για άλλη μια φορά την ευρεία γκάμα υπηρεσιών τους στην παγκόσμια ναυτιλιακή βιομηχανία, ενώ παραδοσιακοί εκθέτες όπως οι Η.Π.Α., το Ηνωμένο Βασίλειο, η Δανία και η Ολλανδία θα έχουν εντονότερη παρουσία από προηγούμενες χρονιές. Ωστόσο, οι εθνικές συμμετοχές δεν περιορίζονται μόνο στα παραδοσιακά ναυτιλιακά κράτη, καθώς τα Ποσειδώνια καλωσορίζουν και νέους παίκτες, όπως το Λουξεμβούργο και τη Γεωργία, ενώ και η Πολωνία θα συμμετάσχει στην έκθεση για πρώτη φορά με εθνικό περίπτερο. Επίσης, τα περισσότερα κράτη σημαίας θα δώσουν το παρόν στα Ποσειδώνια, με τον Παναμά, τη Λιβερία, τις Νήσους Μάρσαλ, τη Μάλτα, την Κύπρο, τις Μπαχάμες, τις Νήσους Κέιμαν και το Παλάου, μεταξύ άλλων, να επιστρέφουν για άλλη μια φορά στη μεγάλη συνάντηση της παγκόσμιας ναυτιλίας. Μεταξύ των συμμετοχών που θα ξεχωρίσουν στα φετινά Ποσειδώνια είναι το περίπτερο των Ελλήνων Κατασκευαστών Ναυτιλιακού Εξοπλισμού (HEMEXPO), το οποίο θα καταλάβει περισσότερα από 400 τ.μ. εκθεσιακού χώρου με στόχο την προώθηση της ελληνικής τεχνογνωσίας και εξειδικευμένων λύσεων για την παγκόσμια ναυτιλιακή βιομηχανία και την προσθήκη περισσότερων ελληνικών προϊόντων στις λίστες κατασκευαστών (makerslist) των μεγαλύτερων ναυπηγείων παγκοσμίως. Η ελληνική παρουσία συμπληρώνεται από ένα δεύτερο περίπτερο, της Διεθνούς Ναυτικής & Βιομηχανικής Ένωσης (WIMA), η οποία εκπροσωπεί τις ελληνικές εταιρείες που δραστηριοποιούνται στους τομείς ναυπήγησης πλοίων, ανταλλακτικών και εφοδίων, στις τεχνικές και γενικές ναυτιλιακές υπηρεσίες και στην παραγωγή ναυτιλιακού υλικού. Μία ακόμη αξιόλογη συμμετοχή είναι αυτή της ελληνικής εταιρείας υπηρεσιών κοινής ωφελείας Gastrade, με την υποστήριξη της Gaslog Ltd, η οποία θα αναλάβει το έργο του Ανεξάρτητου Συστήματος Φυσικού Αερίου Αλεξανδρούπολης, ένα σύγχρονο, πρωτοποριακό και υψηλής τεχνολογίας έργο που αποτελείται από μία υπεράκτια πλωτή μονάδα παραλαβής, αποθήκευσης και αεριοποίησης υγροποιημένου φυσικού αερίου και από ένα σύστημα υποθαλάσσιου και χερσαίου αγωγού μέσω του οποίου το φυσικό αέριο προωθείται στο Εθνικό Σύστημα Φυσικού Αερίου της Ελλάδας (ΕΣΦΑ) και από εκεί προς τους τελικούς καταναλωτές. Επίσης, η κρατική εταιρεία πετρελαίου της Σαουδικής Αραβίας, SaudiAramco, σε συνεργασία με τις εταιρείες Lamprell, NationalShippingCompanyofSaudiArabia (Bahri) και HyundaiHeavy Industries, επέλεξε τα Ποσειδώνια 2018 για να παρουσιάσει στην παγκόσμια ναυτιλιακή κοινότητα την κοινοπραξία της, InternationalMaritime Industries (IMI), που δημιουργήθηκε για να αναπτύξει μία από τις μεγαλύτερες ναυτιλιακές εγκαταστάσεις ολοκληρωμένων υπηρεσιών που περιλαμβάνουν ένα νέο ναυπηγείο που απευθύνεται στον υπεράκτιο τομέα. Η νέα κοινοπραξία έχει ήδη δεχτεί παραγγελίες για περισσότερες από 20 υπεράκτιες εξέδρες και 52 πλοία με ορίζοντα αποπεράτωσης την επόμενη δεκαετία. Και ενώ το πετρέλαιο συνεχίζει να αποτελεί το κύριο καύσιμο για τις παγκόσμιες μετακινήσεις της ανθρωπότητας, τα ψηφιακά δεδομένα γίνονται το «νέο πετρέλαιο»,καθώς αναφύεται ένας θαυμαστός καινούργιος κόσμος όπου θα κυριαρχούν η τεχνητή νοημοσύνη και η «έξυπνη» ναυτιλία. Η ροπή προς την ψηφιοποίηση, οι ανάγκες για λύσεις «έξυπνης» ναυτιλίας και η αυξημένη ζήτηση για διαρκή συνδεσιμότητα του στόλου έχουν οδηγήσει σε ένα εντυπωσιακό άνοιγμα των Ποσειδωνίων προς τον τομέα της τεχνολογίας πληροφοριών και επικοινωνίας, με περισσότερες από 30 εταιρείες να έχουν δηλώσει συμμετοχή, διεκδικώντας ένα μεγαλύτερο κομμάτι από την «πίτα» των ολοένα αυξανόμενων τεχνολογικών αναγκών του πιο σύγχρονου στόλου στην ιστορία της ανθρωπότητας. Σε ό,τι αφορά στο συνεδριακό πρόγραμμα, ήδη έχει διαμορφωθεί σε μεγάλο βαθμό και καλύπτει όλα τα θέματα που απασχολούν τη ναυτιλιακή βιομηχανία. Για άλλη μια φορά, θα λάβουν χώρα περισσότερα από 30 συνέδρια, παρουσιάσεις προϊόντων, τεχνικά σεμινάρια και συνεντεύξεις Τύπου – όλα στο εκθεσιακό κέντρο MetropolitanExpo. Το συνεδριακό πρόγραμμα θα εγκαινιάσει το καταξιωμένο TradewindsShipownersForum, στο πλαίσιο του οποίου θα συζητηθούν όλα τα επίκαιρα θέματα της παγκόσμιας ναυτιλίας. Μία νέα σημαντική εκδήλωση θα είναι το «SUPPORT THE LOCAL MARITIME INDUSTRY SUMMIT» με την υποστήριξη της HEMEXPO και την οργάνωση της Newsfront/Ναυτιλιακή, που θα λάβει χώρα υπό την αιγίδα της Ελληνικής Ένωσης Τεχνικών Διευθυντών Ελληνικών Ναυτιλιακών Εταιρειών (MARTECMA) και θα δώσει την ευκαιρία στις ελληνικές ναυτιλιακές εταιρείες να γνωρίσουν καλύτερα τα υψηλής ποιότητας προϊόντα και τις υπηρεσίες της HEMEXPO. Με αφορμή αυτό το συνέδριο, οι ναυτιλιακές εταιρείες θα αποφασίσουν για μελλοντικές επενδύσεις και θα προωθήσουν περαιτέρω το ελληνικό ναυτιλιακό cluster, το οποίο αναμένεται να συμβάλει όλο και περισσότερο στο εγχώριο ΑΕΠ. Τέλος, μία νέα προσθήκη στο πρόγραμμα συνεδρίων και σεμιναρίων των Ποσειδωνίων είναι το 4ο Σεμινάριο Ενέργειας και Ναυτιλίας, που διοργανώνεται από το Ινστιτούτο Ενέργειας Ν.Α. Ευρώπης (IENE), στο πλαίσιο του οποίου θα αναλυθούν σε βάθος οι παγκόσμιες αγορές πετρελαίου και φυσικού αερίου, καθώς και οι παράγοντες που καθορίζουν το συσχετισμό φορτίων ενέργειας και ναυτιλίας.